Company Name: Asano Fire-Retardant Lumber Co. Ltd.
CELL+FUNEN® is an agent used to make lumber and other materials also made of cellulose-like curtains and cloth noncombustible. Not only are they noncombustible, but these products treated with CELL+FUNEN® do not emit harmful gas or smoke when exposed to fire. CELL+FUNEN® lumber is certified as a noncombustible material meeting Japanese Building Standard Law, which requires that the total calorific value measured by a cone calorimeter after 20 minutes in 750°C heat must be less than 8 MJ/m2. 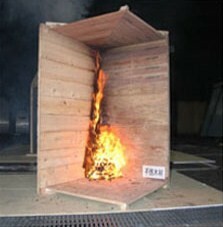 Put simply, when we say CELL+FUNEN® lumber is noncombustible, know that we have the exhaustive test results to prove it. On top of the noncombustible technology, CELL+FUNEN® has the additional benefit of providing cellulose-derived alternatives to products made of mineral and fossil fuel resources, reducing dependence on some of the major sources of global warming. This technology is patented in the United States, as well as in Europe and China. CELL+FUNEN® can make cellulosic material that is not only noncombustible but also resilient to other damage, as CELL+FUNEN® lumber is resistant to both termites and fungi. “Renewable” is the real buzzword worldwide today, and while cellulosic material - such as lumber and cloth - is renewable, unfortunately its application is normally limited by its combustibility. CELL+FUNEN® overcomes this drawback and can widen the variety of products made from renewable cellulosic materials that can be used in buildings. CELL+FUNEN® won an award from the “Japanesque Modern Collection 100,” a nationwide campaign launched by the Japanese Ministry of Economy, Trade and Industry that aims at uniting Japanese culture, design and aesthetics with advanced technology to allow traditional values to enrich contemporary living. CELL+FUNEN® also won an award from the Japanese Forestry Agency in the field of technological innovation. We are eager to license CELL+FUNEN® technology to companies in the U.S., or to work with American distributors to bring this technology to the U.S. market. CELL+FUNEN® is growing steadily in Japan because it can make various noncombustible cellulosic material products — even paper can be noncombustible. This means renewable resources can be used in places heretofore impossible. CELL+FUNEN® lumber is used in crowded areas such as airport terminals, subway station, hospitals and commercial locations (Examples: Narita Airport Terminal 1 and Tokyo Metro Shiodome station). CELL+FUNEN® can also make a noncombustible paper that has been used as wallpaper in restaurants and museums, including in the Suntory Museum, and CELL+FUNEN® cloth has been installed on the wall of a jewelry shop in the Tokyo Peninsula Hotel. As new techniques to create CELL+FUNEN® cardboard and plywood are in development, new markets will continue to open for the product.